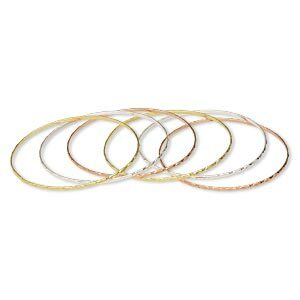 Bracelet, bangle, gold- / silver- / copper-finished steel, 2mm wide with textured oval design, 2-1/2 inch inside diameter. Sold per pkg of 6. 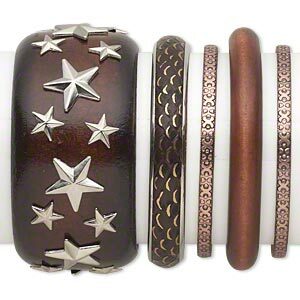 Bracelet mix, bangle, wood (dyed) / copper- / silver- / antiqued gold-finished steel, brown, 4.5-40mm wide with mixed design, 7-1/2 to 8 inches. 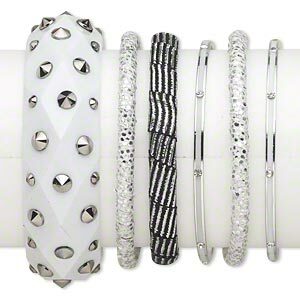 Sold per 5-piece set. 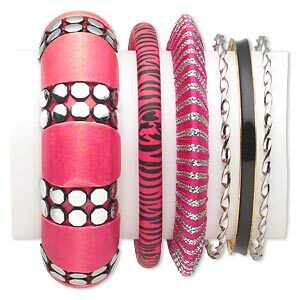 Bracelet mix, bangle, wood (dyed) / polyester / enamel / silver- / gold-finished steel, fuchsia / silver / black, 3-25mm wide with mixed design, 2-1/2 inch inside diameter. Sold per 6-piece set. Bracelet mix, bangle, wood (dyed) / acrylic / gunmetal- / copper- / gold-finished steel, black, 2-29.5mm wide with mixed design, 2-1/2 inch inside diameter. 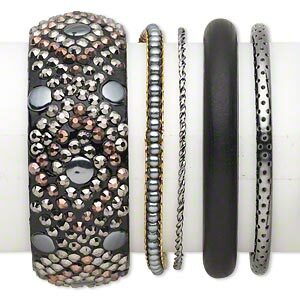 Sold per 5-piece set. 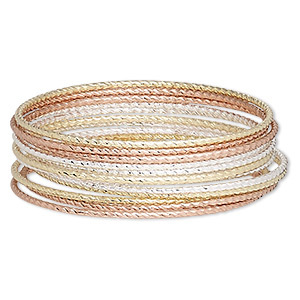 Bracelet, bangle, silver- / copper- / gold-finished steel, 2mm twisted band, 8 inches. Sold per 12-piece set. 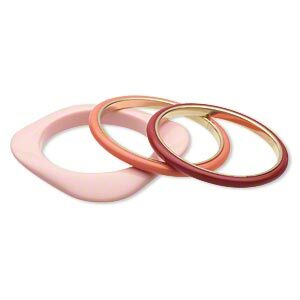 Bracelet, bangle, resin and gold finished-steel, light pink / dark rose / coral, (2) 6mm wide round and (1) 11mm wide square, 7-1/2 to 8 inches. Sold per 3-piece set. 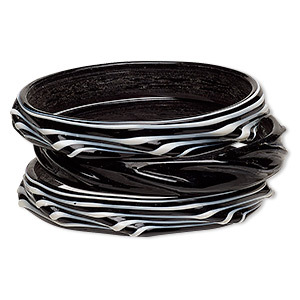 Bracelet mix, bangle, wood (dyed) / plastic / polyester / antiqued silver-finished steel, black and silver, 3-10.5mm wide with mixed design, 8 inches. Sold per 6-piece set. 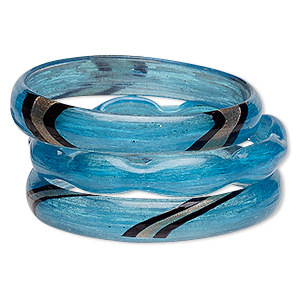 Bracelet, bangle, lampworked glass, black and blue with copper-colored glitter, 12mm wide with wave design and 12mm wide wavy band with wave design, 8 inches. Sold per pkg of 3. 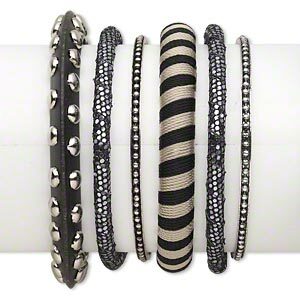 Bracelet, bangle, lampworked glass, black and white, 12-14mm wide with line design, 8 inches. Sold per pkg of 3.